We had reached the heart of the Abandoned Lands, having done the journey somewhat in reverse, by first finding the descendants of the Ancestral Puebloans at their present day homes along the Rio Grande and other nearby regions (Acoma and Taos), and then checking out one of their 'intermediate' settlements at Bandelier National Monument. 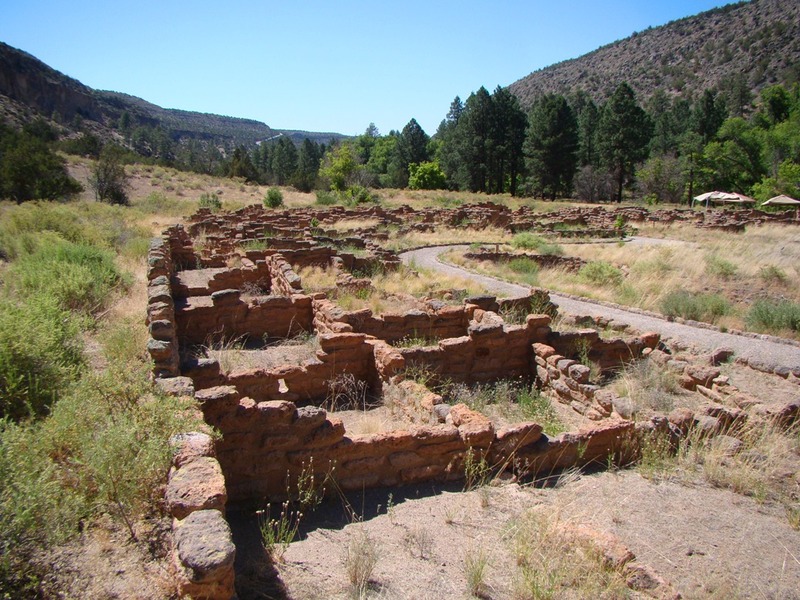 We had also seen one of their recently abandoned pueblos at Pecos. 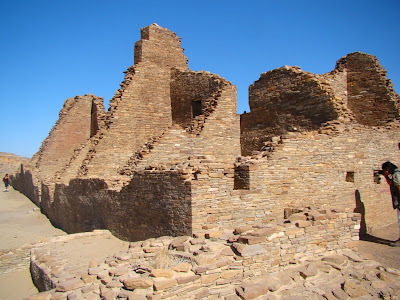 But now we had crossed the desert and had reached Chaco Culture National Historical Park, which for around 300 years constituted the center of the Ancestral Puebloan world. We had arrived on the evening of the summer solstice, and had experienced a kind of eerie night and beautiful solstice sunrise. Below is a stretch of the Great North Road. The roads weren't for wheeled vehicles of course, but were instead pathways for pilgrims, and efficient routes for transporting supplies and materials, especially wood beams. The nearest forests were 40-50 miles away. The Great Houses also reveal their spiritual or political importance in the fact that they were not designed primarily for habitation. The complexes are huge, some with 700 rooms and originally standing four stories high, but not so many hearths for warmth, for instance (and winters are cold in this region despite the desert conditions). Wandering among the ruins, one can see the thinking of the planners and architects: this place was meant to engender a feeling of overwhelming power and awe in the visitor. 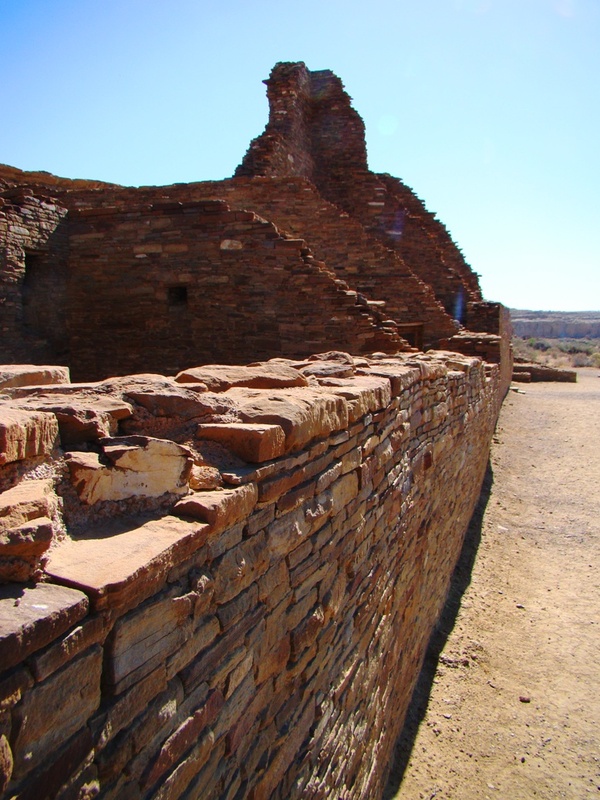 The major complexes at Chaco were built between around 850-1150 AD, and it is remarkable how well they have survived the elements for the last 900 years. 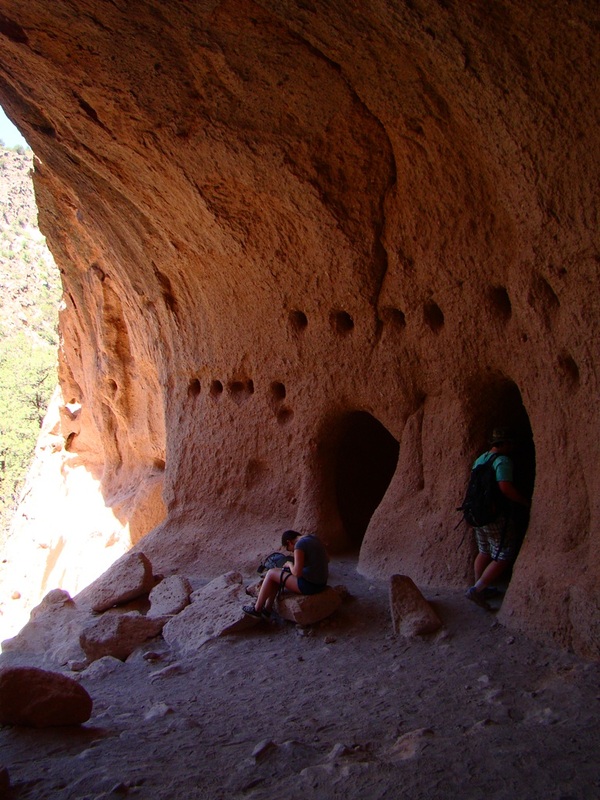 These are not cliff dwellings, protected in alcoves and the like. They are out in the open and exposed to intense weathering from wind, ice and rain. Unlike many other unfortunate archaeological sites, Chaco Canyon today is in a remote location, so the buildings have not suffered as much the trepidations from vandals and early would-be "archaeologists". 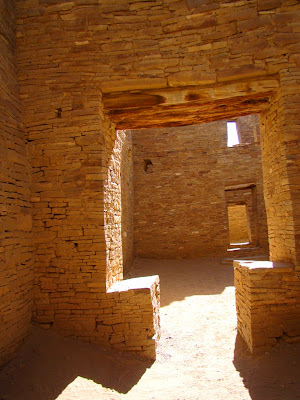 In addition, most of the complexes have never been excavated, and are thus protected beneath their own debris (having the walls exposed at the excavated ruins leads to rapid degradation; it is a cost associated with making a place interesting and educational to visit while trying to preserve the evidence of the past). 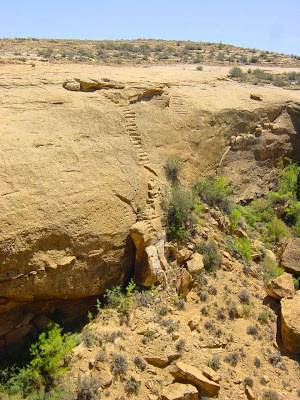 They had geological engineers in their midst, these Puebloans. Pueblo Bonito, the Great House we are touring in these pictures today, was tucked up against a cliff of the Cliff House Sandstone. The Cliff House Sandstone sits on top of a much weaker layer, the Menefee formation, and is often undercut by erosion so that large blocks of the sandstone will often tumble down the slopes into Chaco Canyon. It was clear to the builders that a huge rock threatened the edge of the pueblo (we called the rock "Threatening Rock" in a fit of creativity). 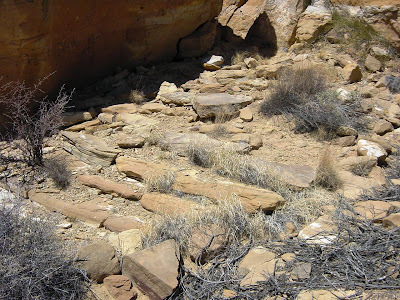 The Puebloans built a berm to try and stabilize the rock, and apparently they did a good job. It didn't collapse until 1941 (the pieces can be seen in the picture above). Pueblo Bonito is a fascinating place to explore, being the most completely excavated of the Great Houses. It had 700 rooms, two great kivas, and a high outer wall that enclosed an area of two acres. The level of sophistication is such that no buildings in North America exceeded this complex in size until the 19th century. 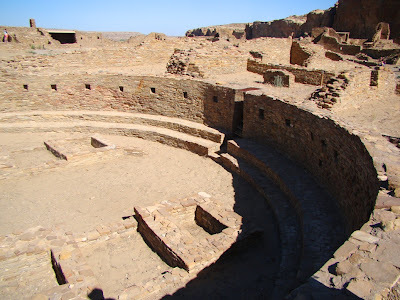 It was uncomfortably hot wandering around the ruins on this particular day, which got me thinking about water at Chaco Canyon. There isn't any to speak of. The climate is very dry with an average rainfall of 8 or 9 inches. What did the Ancestral Puebloans do for water? 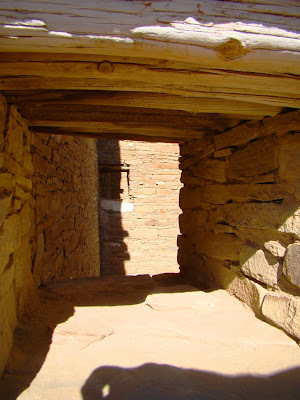 One of the Great Kivas at Pueblo Bonito can be seen below. It was big enough that I couldn't fit the whole thing in a single shot. It took some major engineering to keep a ceiling over this space. The wood used in the door beams and floors of the complex provided the means of dating the Chaco Canyon structures. Dendrochronology could be used to establish when the trees were cut down. The trees were not at all local; they came from mountains 50-70 miles away. Estimates are that 200,000 mature conifers were used in the construction of the Great Houses. This has been just one of the fourteen Great Houses at Chaco Canyon. I'll look at a few others and deal with the question of why they were abandoned in the next post...and throw in some geology, too. A rather extensive earthquake swarm is shaking up the southernmost part of California near the agricultural town of Brawley. At my last count, there have been two magnitude 5+ tremors, with the largest at 5.5. There have been five magnitude 4 quakes, and around twenty that have exceeded magnitude 3. The quakes are occurring between the south end of the San Andreas system and the San Jacinto fault zone just south of the Salton Sea. Some minor damage is reported in Brawley. Even if nothing more comes of this swarm (which is the most likely outcome), the event should remind people that southern California does live under the threat of large damaging earthquakes, and that anyone who lives there owes it to themselves to be prepared. Have water, food, batteries, first aid supplies, and an emergency plan in place. Check out these resources for more information. 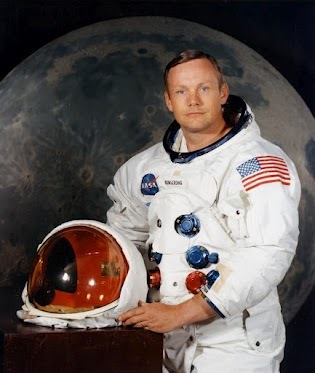 My condolences to the family of Neil Armstrong, who died today at the age of 82. Hearing of his passing took me right back to childhood. In 1969, I was at scout camp high in the southern Sierra Nevada. I'm not sure whose screw-up it was that our troop was in the middle of nowhere at the moment of one of humanity's greatest achievements, but that was the way it was. I can remember walking through the pinyon forest between the dining hall and our campsite (they were pretty far apart). I was alone at the time, and I heard the camp loudspeakers crackle on (which was unusual; we usually only heard "taps" and other bugle calls, or the emergency alarm). I heard a scratchy voice say "That's one small step for a man, one giant leap for mankind", and I realized that humanity had just accomplished something big. Something that had never been done before. It had a profound effect on that scrawny kid in the pinyon forest at Circle B Scout Ranch. I grew up in the early sixties fascinated by astronomy. 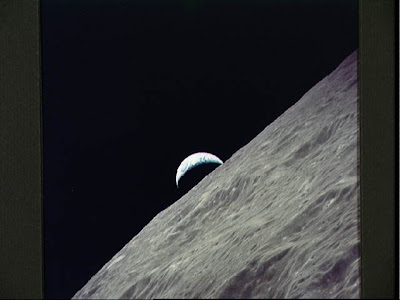 But it was also frustrating that things were so distant and so unreachable by we earthbound humans. Our own moon seemed impossibly distant, despite the objective laid forth by JFK that we would reach it by 1970. The other planets in our own Solar System were small disks in our best telescopes, and the moons that circled them mere points of light. 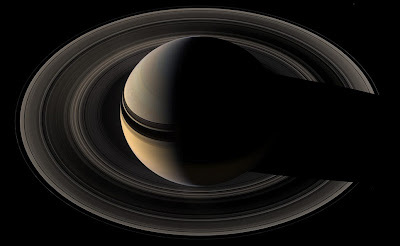 At the time I had a postcard from the Palomar Observatory that had pictures of Jupiter and Saturn similar to those below. I spent hours staring at them with a handlens and later on a microscope, hoping I could make out more detailed features to no avail. The other stars? They were so distant that even in our best telescopes they looked no different, just spots of light. The more I learned about the stars and galaxies of the cosmos, the more impossible it seemed that we could ever reach them. Neil Armstrong, Buzz Aldrin, and Michael Collins changed that. They are heroes of the best kind, courageous men who risked everything to do something that had never before been done. Of course, Armstrong, Aldrin and Collins didn't build the Apollo Spacecraft, or the gigantic Saturn 5 rocket that sent them into space. They didn't navigate to the moon by themselves. There were thousands of engineers and scientists who did the calculations, designed the modules, and shepherded the spacecraft to the moon, and even more importantly, back home again. The vast majority of scientists and engineers were the product of an educational system that was the best the world had ever seen. And they were driven by a communal sense of purpose. They worked together towards a common goal, and their discoveries and innovations radically changed the world we live in. Of course our cynicism allows us to point out that once we beat the Russians to the moon, the public pretty much lost interest in the space program. NASA started to fade from the public consciousness, but the system was in place that allowed a series of successful projects that have changed the way we view the cosmos and our place in it. We never sent astronauts to Mars, but we sent rovers. We sent the Voyagers to Jupiter, Saturn, Uranus and Neptune (in a wonderful case of over-engineering, the spacecraft outlived their expected missions by decades). Not even two weeks ago, Voyager 2 passed its 35th year of operation...it is still sending data from 9 billion miles away with an onboard computer that is probably less powerful than one of those Commodore 64 models that I wrote my thesis on in 1985. 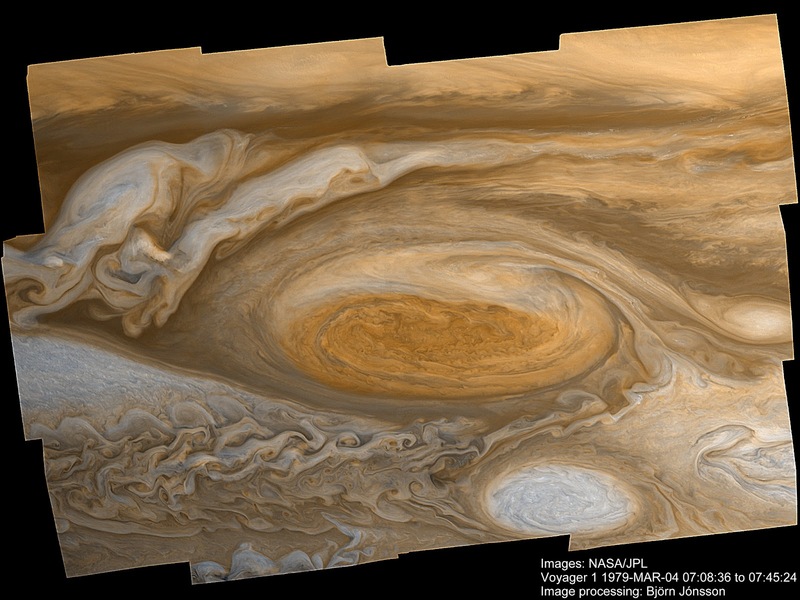 Voyager 1 is also continuing to operate. Today we see our Solar System in stunning detail, in a way that would have been unbelievable to that child of the sixties. We know the surface of Mars in more detail than we know the surface of our own planet. We've explored the moons of Jupiter and Saturn, discovering strange worlds with vast oceans hidden beneath icy crusts, volcanoes of molten sulfur, and lakes, rivers and oceans made of liquid methane. We've peered through the clouds of Venus, and just a few years ago, we photographed and analyzed the hidden side of Mercury that we missed on the first mission three decades ago. The Hubble Space Telescope was the other game-changer. It has shown us the rest of the Universe with a clarity that was unimaginable four decades ago. 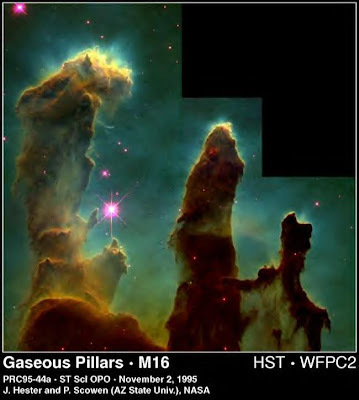 We can see star nurseries and nascent star systems that provide us visual evidence of how our own Solar System formed. The Hubble and other high-tech units have now seen objects that formed a mere half billion years after the origin of the Universe itself 14 billion years ago. This is the heritage of a country that undertook an audacious program of exploration under the leadership of JFK, and which succeeded through the exploits of courageous men like Neil Armstrong, Buzz Aldrin, and Michael Collins. What do our children dream of today? Is our education system inspiring them to strive for incredible things, or is it teaching them to be unquestioning automatons in a factory or office? Are we teaching them to be curious about the world, or teaching them how to take a multiple-choice assessment test? Our teachers and professors are working in a toxic environment these days. How else to explain things like a political party in Texas that added a plank in their platform that says "We oppose the teaching of Higher Order Thinking Skills, critical thinking skills and similar programs that are simply a relabeling of Outcome-Based Education which focus on behavior modification and have the purpose of challenging the student’s fixed beliefs and undermining parental authority."? Is that what we have come to? I refuse to believe that. I believe that adventure still awaits us as a people. As I start a new school year at an institution that is operating on 70% of the funding it had four years ago, I am as excited as I have ever been to have the opportunity to introduce my students to an incredible Universe. And almost every teacher I know feels the same way. Night is a special time...yet in normal life we tend to hold the night at bay, to drive it away with light, whether in our own rooms, or with the glow of vast cities, or with a fire if we are stuck in the back of beyond somewhere. We keep the night at bay, and in doing so we shrink our existence to the size of the room, the city, or the ring of light around the fire. What are we scared of? I guess throughout human history there was plenty to be scared of...animal attacks, attacks by rival humans, getting lost, and in modern days, muggings. But when I am out in the Colorado Plateau, the embracing the darkness is one of the most special experiences I can have. 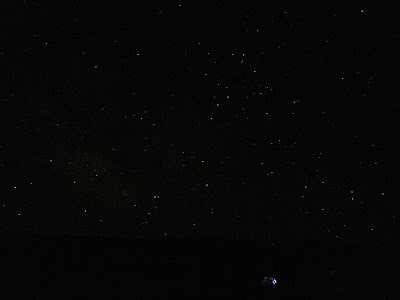 Our trip through the Abandoned Lands had been on the road for a week, and for a multitude of reasons, I was exhausted by the end of the day and had not really spent much time looking at the night-time sky. 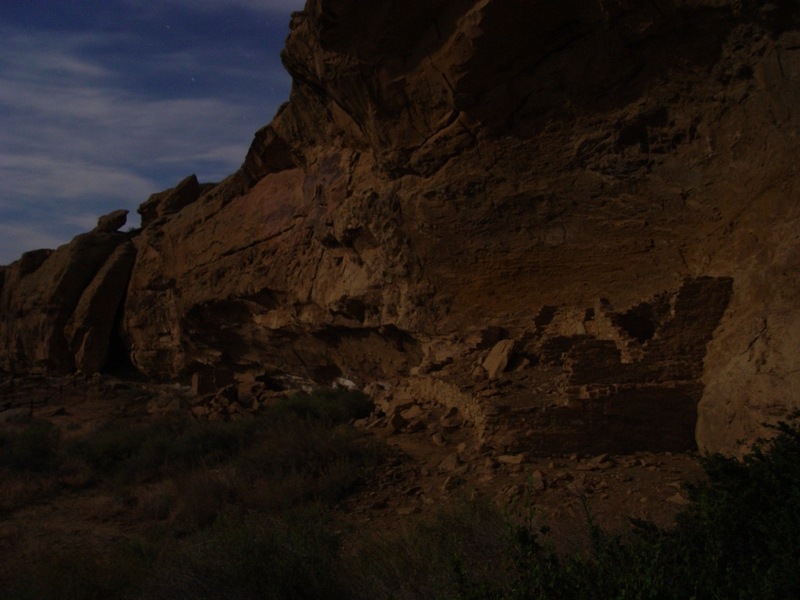 We arrived at Chaco Culture National Historical Park and I made a point of the exploring the darkness. 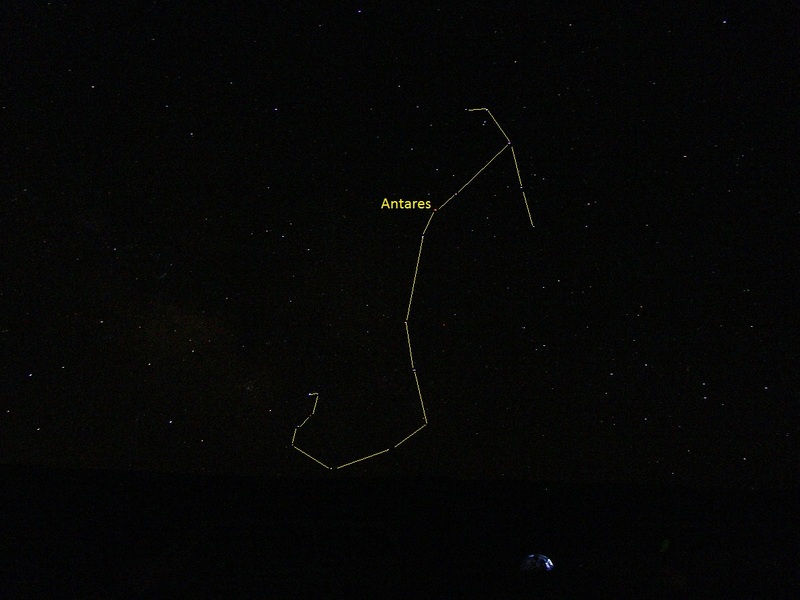 I sat and watched the stars sweeping across the sky, and made a brief effort at capturing a bit of the night in a photo (above). I guess it was pretty late because only one tent in the camp was still lit up. The ancients gazed at the sky and invented patterns. If you know your stars, you've probably already figured out the constellation that fills the center of the photo (you can click it for a larger view). People invented stories to go with the images and the stories involved heroes and legends and eventually gods. At some point the gods became more important than understanding the lights themselves, and the skies began to lose their significance. In the case of the night-time sky, religious explanations settled matters for most people, and they longer had any other reason to look to the heavens, except to keep times and seasons. 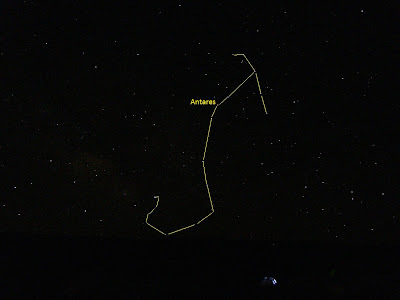 I look at the sky and I can still see Scorpio (I outlined it in the picture below if you don't know the constellations well), but because of science, I have a lot more to see. I've learned that each of those points of light is star like our sun, and that most of the stars out there probably have planets. The cloudy dim light that we call the Milky Way is made of so many stars our eyes cannot distinguish them. Other points of light out there are other galaxies beyond our own, made up of billions of more stars. And there are billions of galaxies. The vastness of the Universe is far beyond our comprehension, but we want to comprehend, so we try to invent new ways to explore. That's the magic to me of science. I don't know what the future will bring on our human journey, but I try to imagine sometimes how quaint our ideas of the cosmos will seem to whoever follows us. On the other hand, there are places that unsettle me. There are plenty of mysteries right here on planet Earth, and the night-time brings out all kinds of journeys of the mind. You are allowed to camp among some of the ruins at Chaco Canyon, allowed to sleep among the ghosts of centuries past. I don't think of ghosts in the sense of spooky spirits and the like, but more the echos of past lives left behind in the ruins adjacent to our campsite. I was looking at pictures of my long-gone grandparents the other day, and I felt the same spiritual echos. Lives were lived and some legacy exists of their brief existence, those of the Ancestral Puebloans in their ruins and artifacts, and my grandparents in an emulsion film on photographic paper. We also hear echos of the past because everything we are is a legacy of those who preceded us. The DNA in our cells is a genetic road map that leads through our parents, our grandparents, and all who came before. Our responses to the environment we live in today were shaped by those who survived in the past. But our responses are also influenced by something unique in all of human history: scientific knowledge. We now know the causes of diseases; we understand chemical reactions and the predictions made by physics; we know of the history of the Earth and the history of our species far beyond the stories handed down by our ancestors. We have an inking of our true place in the cosmos in a way that no humans have ever been able perceive it before. I am thankful to be living in a day and age when the sum total of all human knowledge is available to us in a book, a laptop or a smartphone. 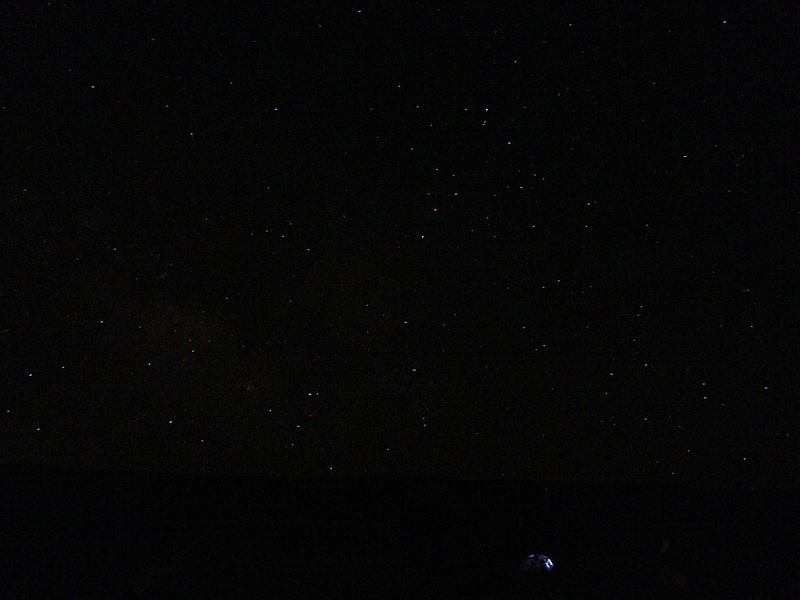 It was a moonless night in Chaco this year. In previous years I've wandered along the road outside camp in the moonlight with a camera, as you can see in the photo above. 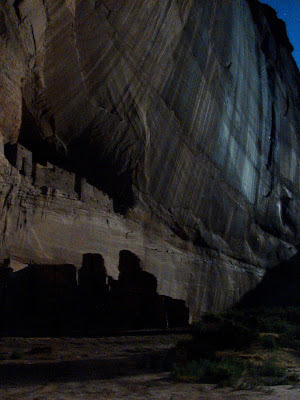 I've also walked in the darkness at White House Ruins in Canyon de Chelly National Monument (below). Spooky? Not really. Mysterious? Absolutely. In the darkness you aren't just visiting or touring, you are experiencing a place more fully, as one notices the sounds and odors more keenly. Your eyes may not be able to see things clearly, but the mind is able to construct things that might be there, or might not. It was June 20th, the summer solstice, the point in the year when the days are longest and the sun is highest in the northern sky. 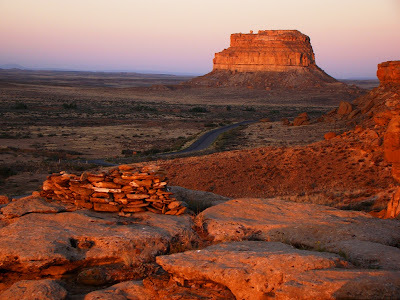 Along with the vernal and autumnal equinox, the solstice was one of the more important days of the year to the Ancestral Puebloans. 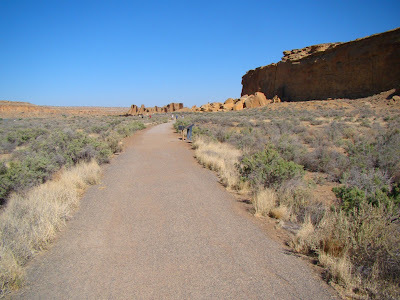 At Chaco Canyon there are petroglyphs that record these moments, most memorably the Sun Dagger (I would love to say that I've seen it and have pictures, but it is off limits, having already been damaged by too much visitation). 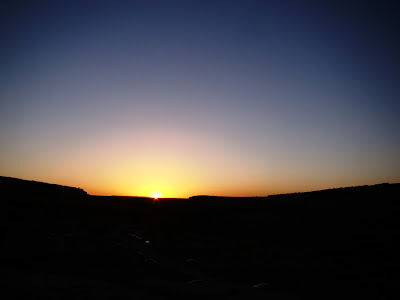 It seemed to me that not only did I want to experience the night, but I wanted to see the sunrise as well. The rays of the solstice sun reached Fajada Butte, and presumably at this moment, the Sun Dagger was pointing to the center of the spiral petroglyph. Camp was beginning to stir and equipment was being packed. 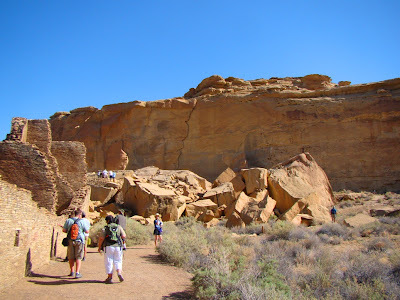 We were going to explore what seems to have been the center of Ancestral Puebloan existence for hundreds of years. A night-time pop quiz for you if you've made it this far: what the phase of the moon right now??? Our journey through the "Abandoned Lands" of the Colorado continued over the flank of one of the larger geological features of New Mexico, the Valles (or Jemez) Caldera, a huge volcanic edifice whose summit collapsed during a catastrophic rhyolite ash eruption about 1.15 million years ago. 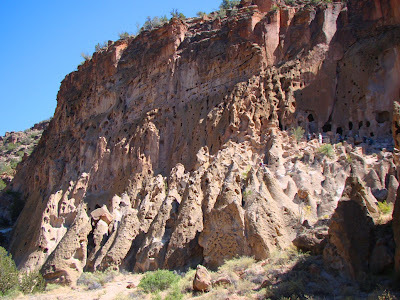 The volcanic center produced the incredible scenery that we observed at Kasha-Katuwe Tent Rocks National Monument, and the setting for the strange ruins we saw at Bandelier National Monument. 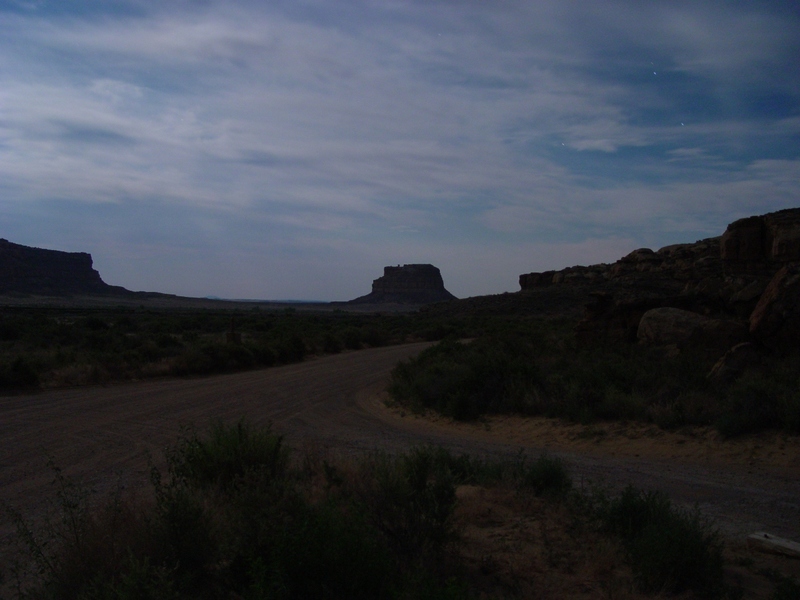 It was a highly unusual sight for us after a week on the road in the southwest in that it was also lush and green. I guess it helps that we were at 9,000 feet, so that even in a drought year there had been a bit more precipitation. 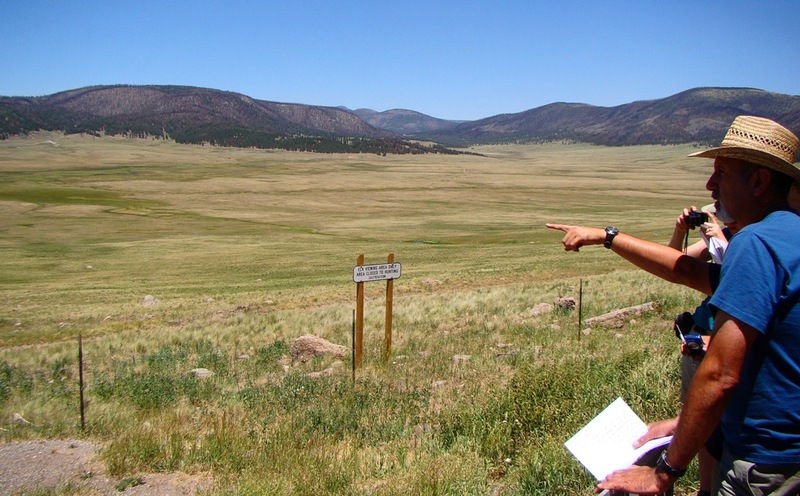 The highway skirts the outer edge of the twelve-mile wide caldera so there is no one place that one can see the full scale of the feature. The meadows in the picture above are only 2 miles across.We'll have to depend on radar imagery to get a full sense of the shape of things (below). Image of the Valles Caldera courtesy of the New Mexico Bureau of Geology and Mineral Resources. The eruptive activity of the caldera coated thousands of square miles with ash, and being an eruption that was hundreds of times larger than St. Helens, destroyed all life over a vast region. At first the caldera basin contained a lake. Eventually the edge of the caldera was breached, the lake drained, and Jemez Creek eroded the deep gorge of San Diego Canyon. Numerous other smaller canyons have been carved into the margins of the volcano as well, including Frijoles Creek which we explored in Bandelier. It has been around 60,000 years since the last volcanic activity at the caldera, but magma still simmers in the heart of the volcano. Heat flow under the caldera is high, and hot springs can be found around the margins. We found one of them while driving down San Diego Canyon, something so out of place that I hit the brakes and came to an unexpected and unannounced stop (to the chagrin of the five vans following me...). 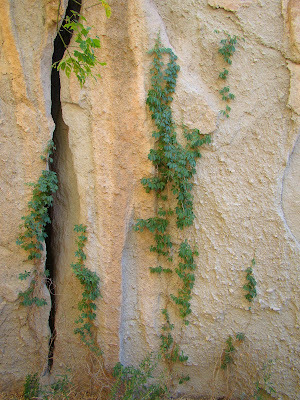 It has to do with the "inside-out" cavern of today's post title. 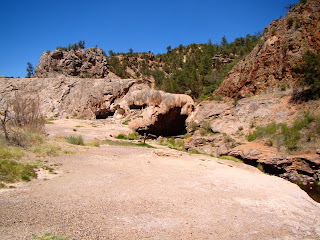 We had happened upon Soda Dam, an outstanding example of a travertine bridge. Caves usually form because limestone layers are dissolved as acidic groundwater moves through fractures and crevices. 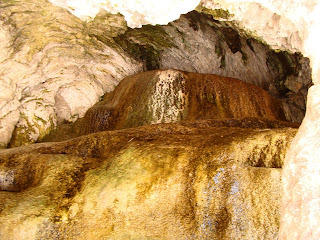 The familiar speleothems (cavern features) like stalactites, stalagmites and flowstone result later on when carbonate-rich water drips into the cavern and a bit of evaporation causes the calcium carbonate (called travertine) to precipitate. In this case, hot acidic water has certainly dissolved limestone, but faulting forced the hot carbonate-rich water to the surface at springs. Instead of filling caves with features, the features form on the surface of the Earth instead. An inside-out cave. The travertine built up around the springs and the deposits ultimately built up a dam-like feature that crossed the canyon floor, forming a natural bridge. The travertine bridge has numerous cave-like features, including flowstone and rimstone pools. I suspect it once had stalactites and stalagmites in the small cave openings, but the site is too accessible from the highway for such features to survive the inevitable vandalism. 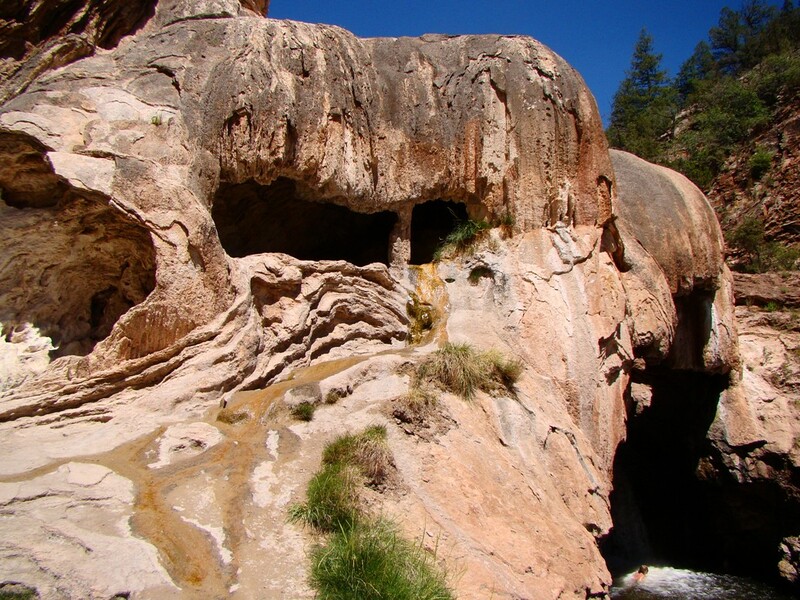 The hot springs have been active for nearly a million years, as evidenced by travertine deposits high on the canyon walls. Other deposits nearly the valley floor are around 60,000 years old, giving an idea of how rapidly San Diego Canyon was carved. The Soda Dam itself is about 7,000 years old. The springs flow at a small fraction of their original volume. The dam was breached during highway construction so that the main flow of the springs no longer reaches the travertine bridge, other than a small trickle. The travertine is disintegrating, both naturally and from vandalism. 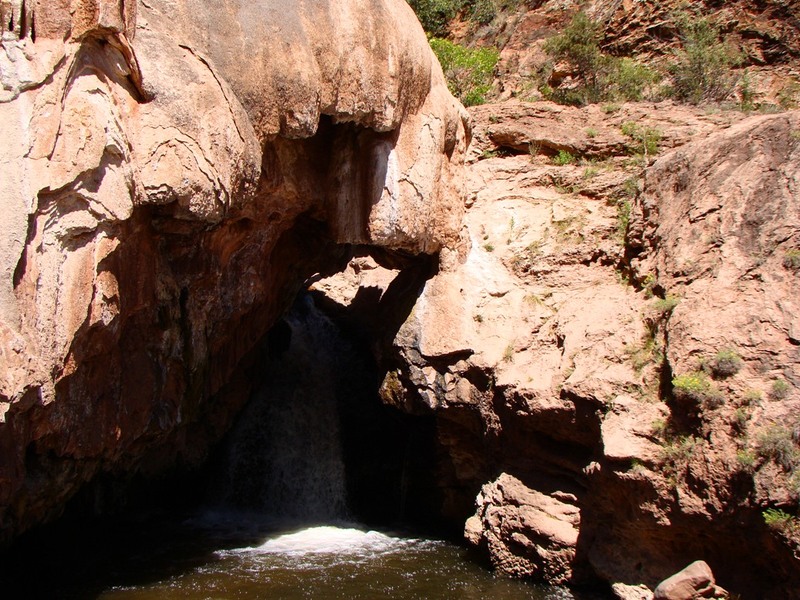 Jemez Creek forms a nice waterfall at the Soda Dam, and a sumptuous-looking swimming hole can be found at the base. 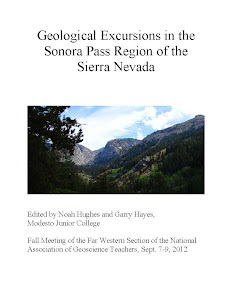 A nice source on Soda Dam and the many other geologic features of northern New Mexico can be found in The Geology of Northern New Mexico's Parks, Monuments, and Public Lands from the New Mexico Bureau of Geology and Mineral Resources. My ancestors migrated. My great-grandfather's family was struggling to survive in the hill country of Kentucky, and with eight hungry children it wasn't easy. In the early 1900s they heard of farmlands and jobs in the Indian Territories north of Texas, the land that would soon be known as Oklahoma. They arrived, and although life was still hard, the family thrived. After a generation, things began to change. There were a series of drought years, and the Great Depression added to a hard existence. There were the horrific dust storms, and in 1936 a tornado destroyed my grandfather's house, nearly killing him. But they hung on. They found jobs here and there, and always kept up a vegetable garden in their spare hours. They canned food when they could, and sold fresh vegetables off their wagon in town. World War II was well underway when the family made a momentous decision. Relatives in California said that things were better out there, and that they should move west. The family sold most of their things, loaded up their car, drove through New Mexico, and got as far as Kingman, Arizona before their transmission failed. The repairs took six days and nearly all their money, but they labored on, traveling at night through the Mojave Desert and arriving the next morning in the Central Valley. We're still here several generations later. 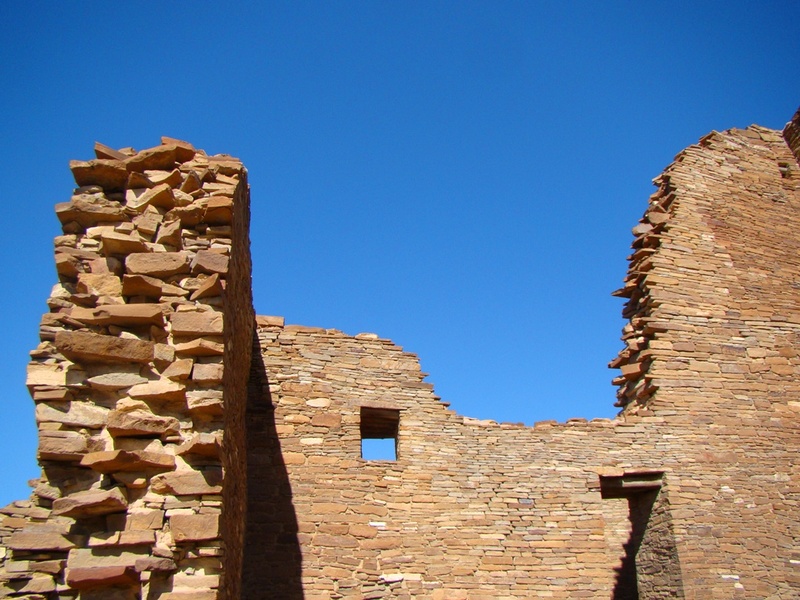 Reading about the journeys of the Ancestral Puebloans made me think of my own family history. How intolerable did things have to become to cause a person, a family or a village to give up and move on? 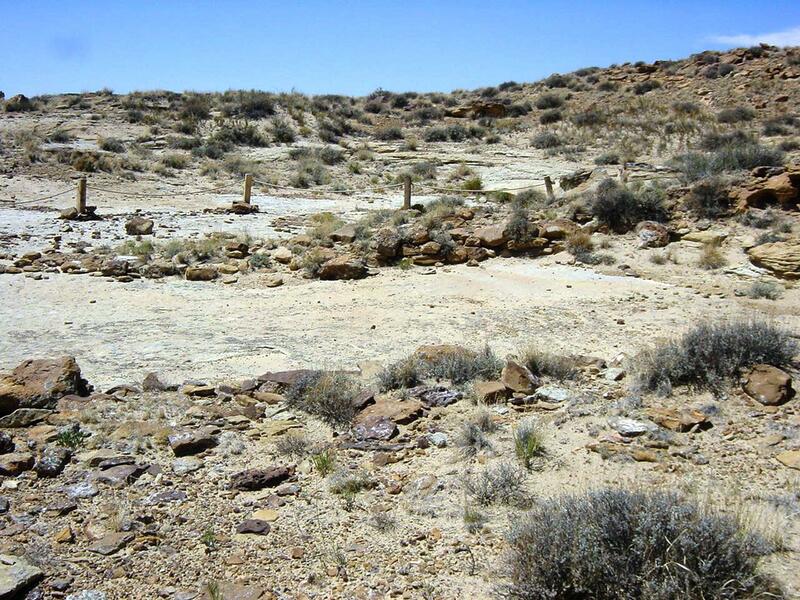 Something happened on the Colorado Plateau that caused entire societies to abandon the region. 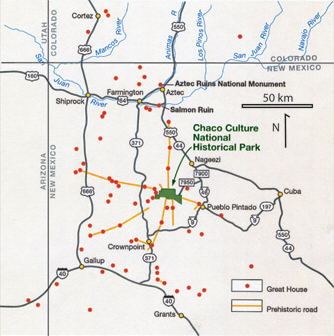 Many of the displaced groups headed southeast, presumably because of stories of more secure water supplies along with relatively unpopulated but arable lands near the Rio Grande River. I've been telling the story backwards. 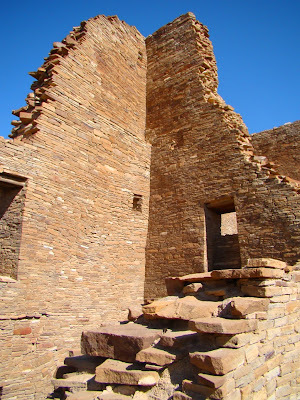 I've had a couple of posts about the pueblos at Acoma, Pecos and Taos where the Ancestral Puebloans ended up and are thriving today. 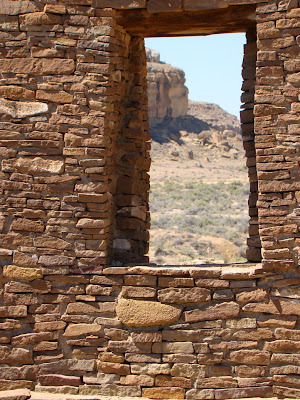 Today's post is about the middle of their journey, a place that was a population center for several centuries, but which was ultimately abandoned as the inhabitants moved down into the Rio Grande Valley. It is Frijoles Creek on the flanks of the Jemez Caldera which is preserved as part of Bandelier National Monument. 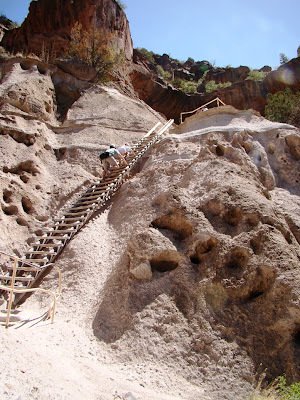 Bandelier has one of the stranger geologic settings of any archaeological park. 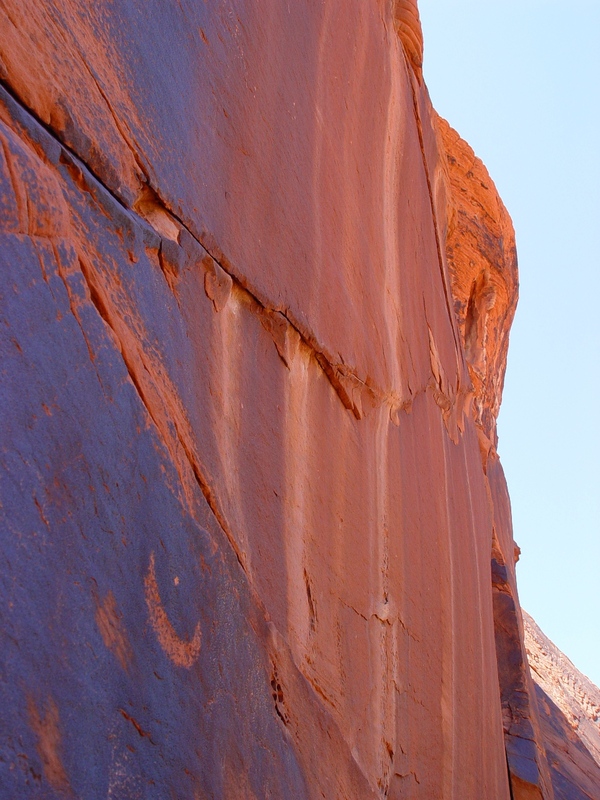 The walls of the canyon are full of holes, not unlike a giant chunk of swiss cheese. We had seen a place like this on the first morning of our trip, at Hole in the Wall in the Mojave Desert. 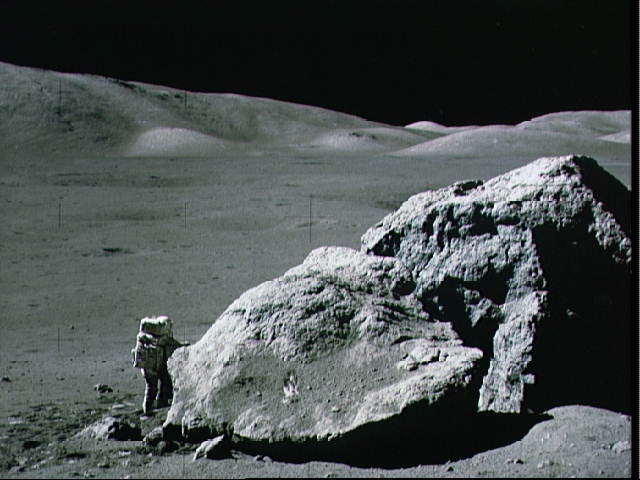 It resulted from differential erosion of a thick layer of rhyolite tuff. Here at Bandelier, the origin is the same, only from rocks much younger. 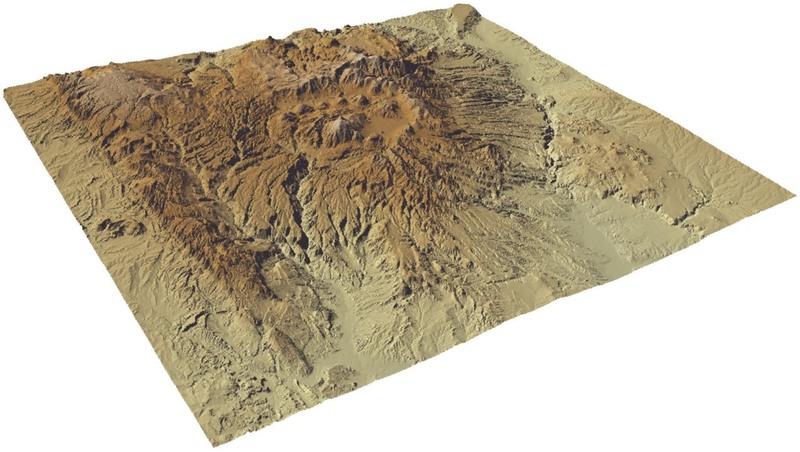 It was less than 1.2 million years ago that a vast eruption blanketed the region with a thick layer of hot ash, more than a hundred cubic miles worth. The source of this incredible explosion was a vent to the northwest. 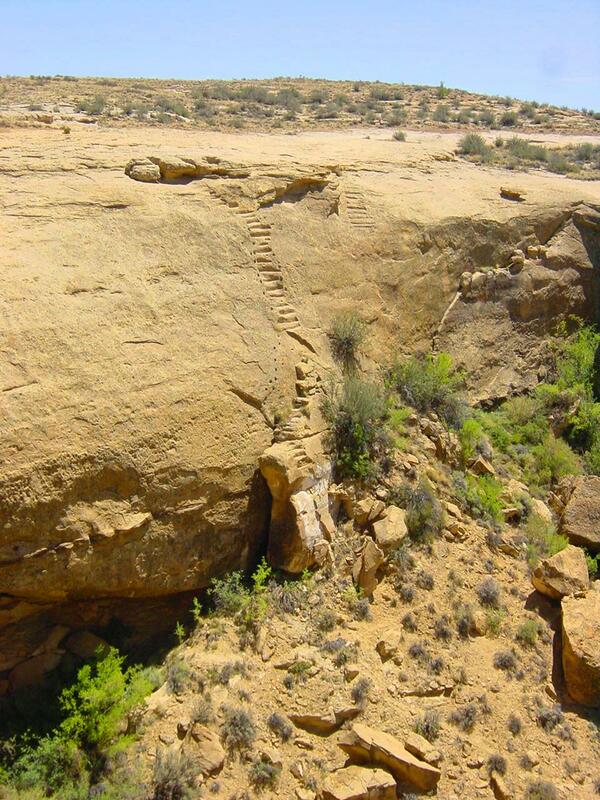 The erosion was so huge that the crust collapsed into a vast hole 12 miles across. The Jemez (or Valles) Caldera, as it is called, is one of the three active supervolcanoes in the United States. Yellowstone is the best known, with the California's Long Valley Caldera at Mammoth Lakes being the other. The ash at Bandelier is soft, but readily forms cliffs, so the inhabitants of Frijoles Canyon took the holes and enlarged many of them into rooms. 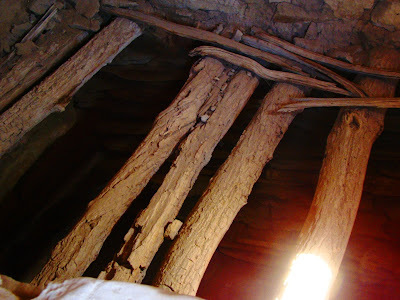 Other rooms were built out from the cliffs, reinforced by logs embedded in the ash. 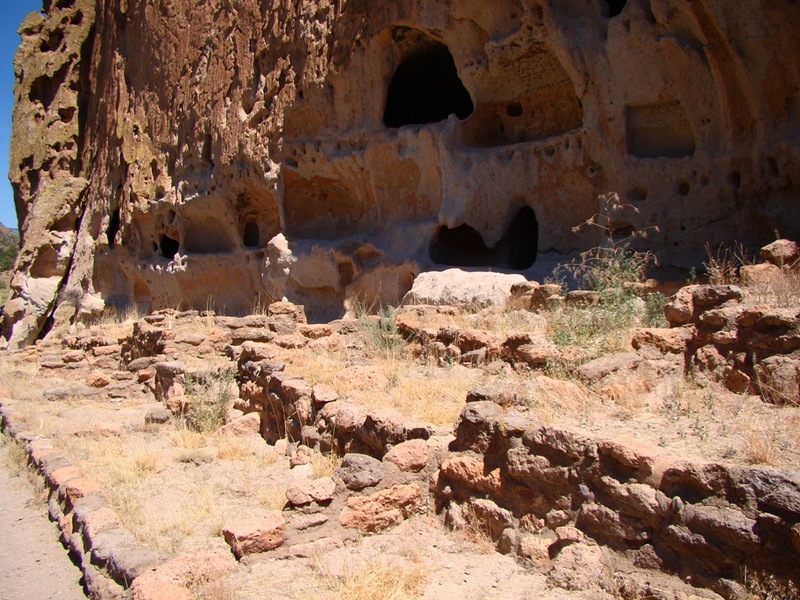 People have lived in Frijoles Canyon off and on for several thousand years, but the majority of the structures and villages were constructed after 1150 AD, when the Colorado Plateau was beginning to be depopulated. 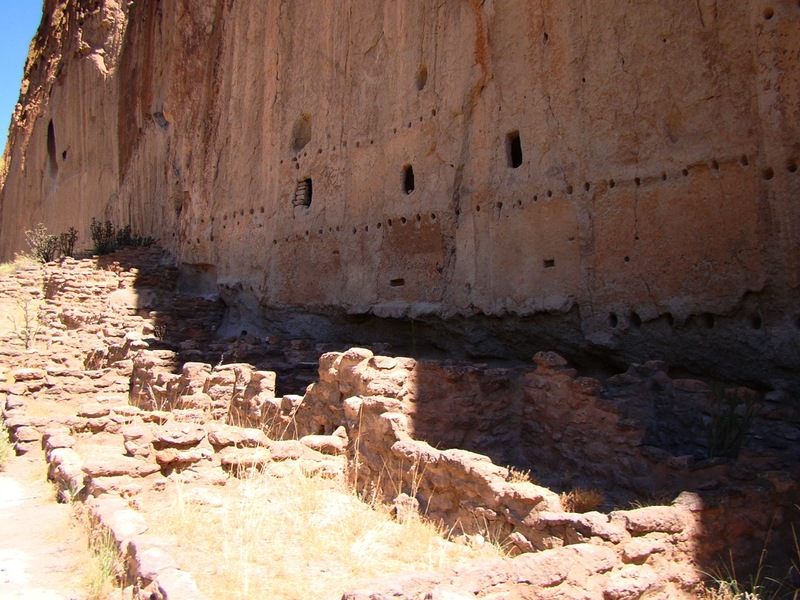 The villages at Bandelier were abandoned by the middle of the 1500s as the Puebloans moved closer to the Rio Grande River. 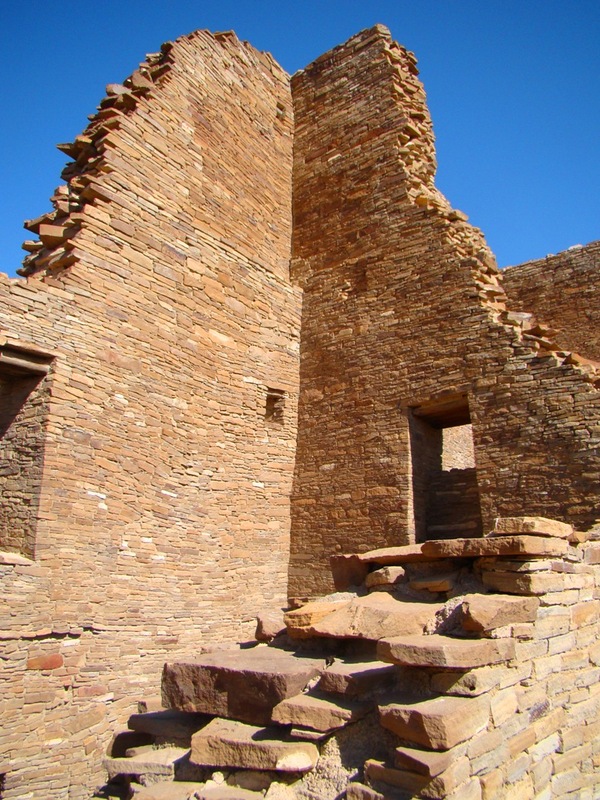 Their descendants live on in the present-day pueblos. The canyon is a fascinating place to explore. The large village of Tyuonyi is easily accessed from the visitor center. A huge excavated kiva can be viewed next to the village. 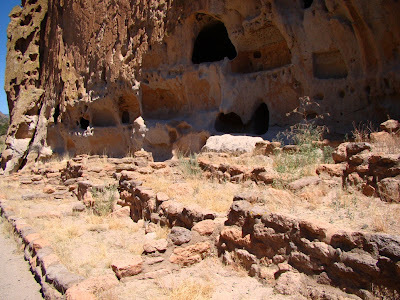 The most spectacular ruins are those which are scattered along the base of the cliffs for a long distance up the canyon. 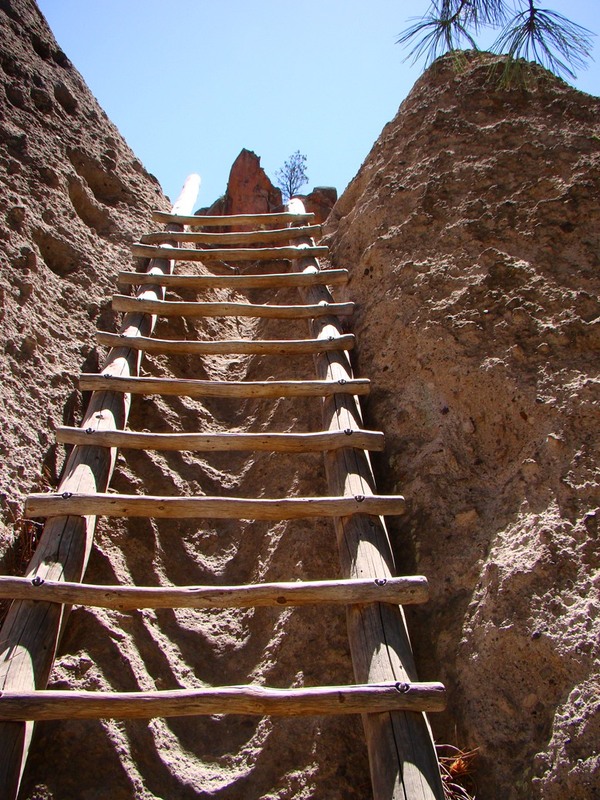 A trail winds up and through the ruins, and ladders provide access to some of the cavern openings. ...including this tree that I can barely believe was alive. 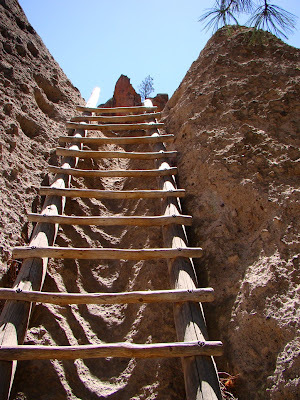 If you suffer from acrophobia, I will definitely not recommend the trail to the Alcove House (below). 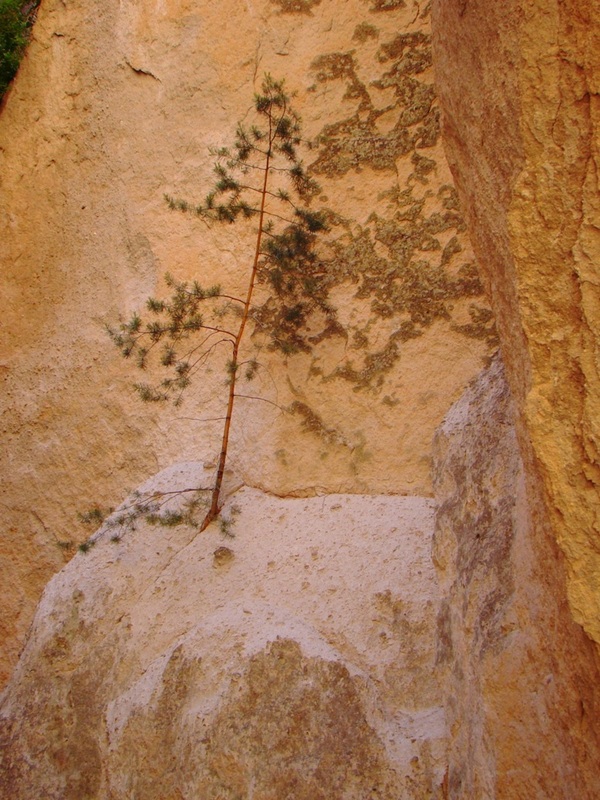 It is 140 feet above the canyon, and is reached by a series of ladders. If you don't mind the exposure, the payoff is pretty amazing. The Alcove House was a dwelling with 22 rooms and a kiva, which has been reconstructed. 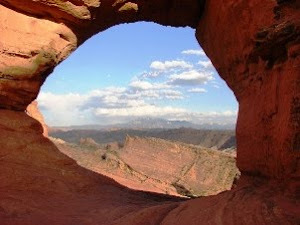 The alcove provides a marvelous view up the canyon (check out the first picture in this post). 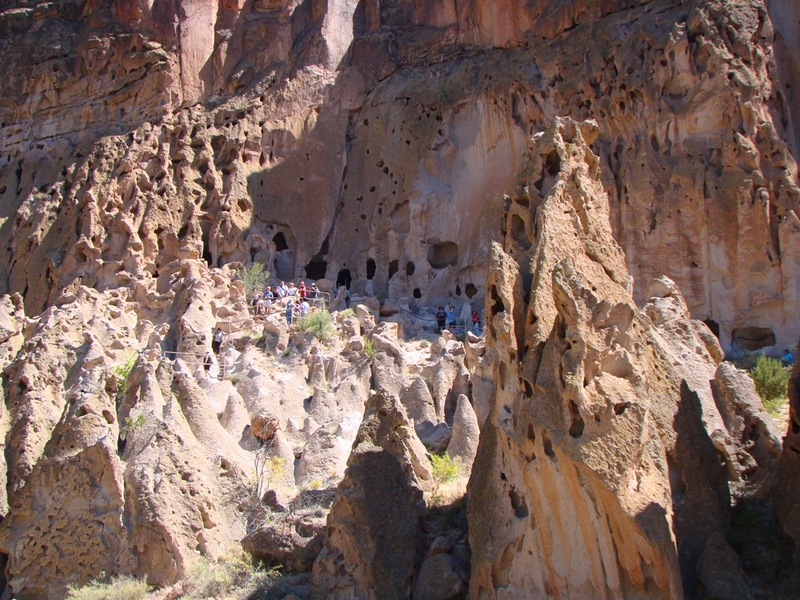 Bandelier was ravaged by two disastrous fires in 2000 and 2011. The most recent fire burned 60% of the park. Although the visitor center area did not burn, the area upstream did, and the slopes have lost the vegetation that would prevent flashfloods from developing. The floods have wreaked havoc on the park, with trails and bridges being repeatedly washed out, while parking and picnic areas have been inundated. Private cars are currently being parked just outside the park and shuttles provide access. The park has a campground on the plateau above the canyon (including group sites). 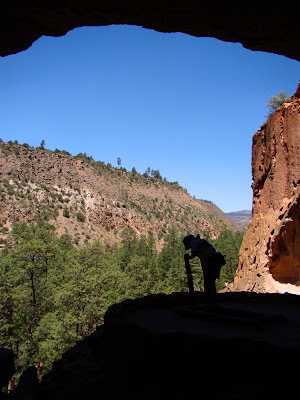 I've written about Bandelier a few times before when I was working on "Time Beyond Imagining". Check out this post, and this one.